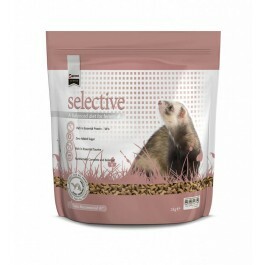 Science Selective food is recommended by vets and is a nutritionally complete and balanced diet for ferrets. A perfect blend of ingredients has been selected to ensure ferrets get the right balance of proteins, oils, vitamins and minerals. Selective Ferret can help to reduce pet odours, and with extra linseed and Taurine, Selective helps keep eyes, coats and bodies healthy – inside and out. High levels of sugar in a ferret’s diet can lead to overeating and obesity. It can also lead to dental problems too. Science Selective Ferret kibble has no added sugars. As ferrets have a very short digestive tract, they need a diet that is very high in protein and low in fibre. Science Selective contains 36% protein and only 2% fibre. Helps maintain healthy skin and coat. Poultry meal, wheat, refined chicken oil, fish meal, turkey meal, sugar beet pulp, potato protein, linseed, chicken liver digest, soybean oil, salt. Protein 36.0%, Crude fibre 2.0%, Fat content 19.0%, Inorganic matter 8.0%, Taurine 0.15%. Vitamins: Vitamin A 15000 IU, Vitamin D3 1500 IU. If you are feeding Selective to your ferrets for the first time, make sure you change from one food to another, gradually over 7-10 days. At first, you should mix a small amount of Selective with your ferrets’ current food, slowly decreasing the old diet, whilst gradually increasing the quantity of Selective. A sudden change in diet can cause digestive upsets – even when you are changing to a better quality diet – so take care! If your ferrets are used to a sugary diet, you may find it takes them a while to change, but persevere as it will help to benefit your ferrets’ health in the long term. And don’t forget fresh water! Your ferrets should have an unlimited supply at all times.